AARON MATE:	It’s The Real News. I’m Aaron Mate. A second German soldier has been arrested in the investigation into an alleged false flag terror attack. The suspects are accused of plotting to shoot left-wing politicians and then pin the blame on Syrian refugees in Germany. The first soldier in the plot was found to be posing as a Syrian. The case has fueled concern over a larger neo-Nazi network within the German army. Liz Fekete is director of the Institute of Race Relations in London. Liz, welcome. AARON MATE:	Hi. So this is an unusual case. Can you tell us what we know about it so far as details slowly come out? LIZ FEKETE:	Well, it all sort of started about a week ago when the evidence emerged that this lieutenant in the German army, a young soldier, had been arrested. It all happened after a tip off because he’d left his old gun in a toilet in an airport in Vienna. He was arrested and investigation rumpled on and a death list was found of some of the politicians that you mentioned. Should also say that there was a plan also to attack refugee centers. It’s quite extraordinary because he had taken up a fake identity of a Syrian refugee. How that happened is a long story. He was arrested, shortly afterwards a student accomplice was arrested, live ammunition was found in one of the places where they were living having been stolen from military, and only a few days ago it was announced that a second soldier had been arrested. 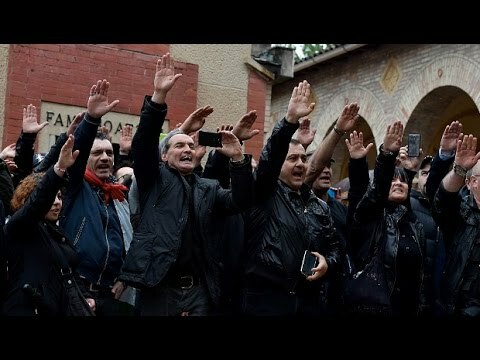 It’s believed that they were part of a cell of probably five people and the case rumples on because for a number of years now there has been concerns that the German military hadn’t been doing enough to investigate and to get rid of soldiers with neo-Nazi affiliations. So it’s part of a bigger scandal, I’m afraid. AARON MATE:	So let’s get into those larger issues. People around the world have been looking to Europe with a lot of concern, tracking the rise of the far right over these recent years. Can you place this German case in the wider context of anti-immigrant sentiment in Europe that you’ve been studying so extensively? LIZ FEKETE:	There is the issue of the huge increase in racial violence around Europe. So in this case, as I mentioned, the neo-Nazis within the army were planning to attack left wing social democrat politicians, but they were also targeting asylum seekers in their refugee hostels and there’s been a massive increase in racial violence on refugee hostels all around Germany, indeed, in Sweden, Netherlands, and other places. In the UK particularly after the decision to leave the European Union, you might have heard of Brexit there in America, in the immediate aftermath of that there was what people have described as kind of celebratory racism, people going out onto the streets and feeling really liberated in that they could make really disgusting racist comments, pull up the hijabs of Muslim women. Exception, of course, we had the murder by a far right sympathizer of the labor MP Joanna Cox in this country. Throughout Europe, actually, there have been numerous attacks on refugees, immigrants, but also left wing politicians. One thing that I like to remind people about is that also in massacre by Anders Breivik was also of a sign of political violence against the left because those 50-odd youngsters murdered so callously and horribly by Breivik were attending a Labor Party Youth camp in an island on Victoria Islands. So yeah, this is the problem that we face in terms of the rise of racism and racial violence. However, not all of this violence is carried out by far rights and white supremacists. Some of it is carried out by villagers in a small town in Germany who do not want a refugee hostel there. So that’s one issue, but there is another issue of the far right that I feel is not sufficiently understood and it’s the greatest issue that we face. Because you, in the US, I’m sure you would have been following the election in France and the largest score for far right candidates since the second World War, in the second round, when they were leading the pack. But the focus, when it’s just on what happens in elections, whether it’s national, local, regional, can actually obscure a bigger problem in society, which is the problem of collusion between far right and extreme right parties and the police and the military and the security services. So you actually have a situation in Greece with Golden Dawn which is a horrible far right party who’s 18 of it’s Parliamentarians are actually facing a large scale criminal investigation, are on trial for the murder of … Linked to the murder of an anti-fascist Pavlos Fyssas. But basically, a criminal controversy, involved not just in a tax on immigrants, on Muslims, but actually operating like the mafia. So you have a problem that groups like Golden Dawn, Front Nationale, have high levels of support in the police and the military. So the problem is that if they achieve power, if they have access to the leverage within the state law enforcement institutions, you’re really in a different ball game all together. I think you understand that in the US now. AARON MATE:	So let me ask you about the problems, not just on the far right, but also in those considered “in the center.” You mentioned France. When Le Pen lost, there was obviously a huge sigh of relief from anybody who opposes racism. But I think that what the reaction to the France election overlooked is that, especially in a case like France, racism against Muslims has meanwhile been mainstreamed. So it’s not just a problem of the far right in defeating someone like Marine Le Pen. LIZ FEKETE:	Absolutely. I couldn’t agree more. It’s a really difficult situation to be in. We work very closely with the collective against Islamophobia in France. This problem of Islamophobia is a form of racism which actually cuts across left and right. So you have a sense … Well, the Socialist Party in France for instance were quite happy to support and extend bans on the hijab, obviously full face veil coverings, etc., because in France, there is a concept of secularism which actually goes beyond any concept of secularism in the Anglo-Saxon world for instance. Whereas secularism means the state doesn’t identify itself with any religion, but upholds the rights of all people of all faiths to practice their religion. Whereas in France, the concept of [inaudible 00:07:53], or secularism, is no visible expression of religion in the public space. So Islamophobia has been a problem as much in the Socialist party as it’s been in the Republicans, in the right parties, and in the FN. Having said that, I think the general feeling was, and I certainly share this feeling, is that although people might say, “everything will carry on as normal now Macron is in power,” nothing will change in terms of the racism that various communities face. There is a sense that, going back to the point that I was making before, that if Le Pen had achieved the presidency, how it would have emboldened her supporters, emboldened white supremacists, white nationalist movements, would have emboldened counter-Jihad and Islamic movements. To feel that now that there was no longer the rule of law, in terms of minorities, and that this celebratory racism that we saw after Brexit was legitimate now because their person was in power. So it’s not an easy situation. Certainly in France, people do not feel that there has been any step forward in terms of Islamophobia with the election of Macron. AARON MATE:	Okay, so let’s contrast that with another country that you mentioned earlier, Greece. I think one policy of the Syriza government in Greece that’s been overlooked, but I think it provides a really striking contrast to what we’re seeing in Europe is how Syriza granted citizenship to tens of thousands of children of immigrants, a real departure of what we’re seeing elsewhere. I’m wondering if you can talk about that and whether that provides a model for what could be followed in Europe to address the issues that we’re facing today. LIZ FEKETE:	Yeah, certainly once Syriza came into power, they came into power with a lot of vision and a lot of hope for what they could do in terms of rectifying injustices, long term injustice, in terms of precarious citizens, young people. And yes, they did that while coming to power. Unfortunately, the situation with austerity and the conditionalities imposed on Greece has made things incredibly difficult in terms of achieving justice for recent migrants and refugees. Now, we have imposed on Greece, of course is the EU Turkey deal, which means that Greece is basically being used as a buffer state to stop the forward movement of refugees who are landing in Greece after taking perilous sea journeys to the rest of Europe. Europe is [inaudible 00:10:46], it’s really terrible what’s happening. The EU countries, there’s no solidarity between EU countries in terms of meeting their obligations to take their quota of refugees after the extraordinary movement of people since summer for 2015. So basically, I’m afraid it means that in Greece, at the moment, the detention centers are places of huge misery, squalor … There’s been 13 refugee and migrants deaths in Greece over, I think, about the last 12 months, and six of these have taken place in the so-called hotspots. I’m afraid the management of these places is pretty diabolical. Although the overall situation is not of Syriza’s making, everybody is just blaming each other and it’s not a good situation for anyone. AARON MATE:	So finally, Liz, connecting this issues, can the surge in far right politics in Europe, can it be slowed without also stopping the wave of neo-liberal austerity policies that you mentioned? LIZ FEKETE:	You’ve hit on the fundamental contradiction. Chomsky, I was in London recently and I saw that he was giving a lecture. He said something I think was very, very pertinent. That it’s actually the neo-liberal policies that have hollowed out democracy and have created the conditions for fascism. For me, looking at this issue in the realms, there is a lot of similarities between the way neo-liberal policies crush people. They’re crushing ordinary people. Whether it’s black people, migrants, refugees, or even white workers are being crushed. It’s very similar to the fascist approach to human dignity which is pretty crushing as well. What I see happening, actually, at the moment, looking at the larger picture is that actually I think that states are very canny and I think neo-liberalism will try to rejuvenate itself through embracing aspects of nationalism in sense of embracing the idea of a stronger state. So the idea of this sort of state floating free and leaving everything to the market, I think we will see changes in that. In terms of patterns recently in terms of support for far right politics, alternative for Germany still doing well, still getting into regional parliaments, but it’s not making the break through that people are predicting. Le Pen hasn’t made break through. In Austria, the freedom haven’t made break through. So it’s looking to see how these things balance themselves out and whether neo-liberalism is known to embrace aspects of nationalism, and certainly that’s what we’ve seen in the UK after Brexit, the conservative party basically taking on the policies of UKIP. So we talk about the UKIP-ization of the conservative party. But it’s not all bleak. It’s very turbulent times and things are changing very rapidly, but I see social movements growing. I see care and solidarity growing. We talked about the refugee crisis. We talked about the bad things that are happening in detention centers, but we’ve also seen the largest mobilization since the second World War of humanitarian workers. Not just humanitarian workers, but ordinary citizens who responded to the refugee crisis, not with anti-immigration and nativist sentiments, but actually getting out there to give food, to give money, to give support to children. So it’s not all bleak. There is something in Europe. There is a humanitarian e-force there at the bottom of society and we are seeing that rejuvenated and energized in equal measure to how see the crushing of the human spirit under neo-liberal policies and under fascism. AARON MATE:	A very hopeful note to end on. Liz Fekete is Director of the Institute of Race Relations in London. Liz, thanks so much.